The company will discuss information regarding how its custom-designed stainless steel pressure vessels increase efficiency of BioPharm processes. 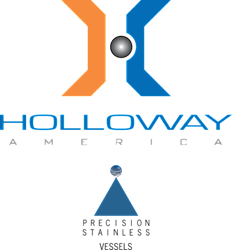 HOLLOWAY AMERICA provides custom stainless steel pressure vessels and other machinery for pharmaceutical and biotech companies. A leading provider of stainless steel pressure vessels and components, HOLLOWAY specializes in custom engineering one-of-a-kind solutions for intricate processes. HOLLOWAY AMERICA, a leading custom stainless steel fabrication company, will attend the International Society of Pharmaceutical Engineering (ISPE) Rocky Mountain Chapter 21st Annual Vendor Exhibition on Thursday, February 18, 2016. The Rocky Mountain Chapter of ISPE is expecting to fill more than 100 tables for its annual event, which will run from 3:00 p.m. - 8:30 p.m. at The Westin hotel in Westminster, Co. Established in 1996, the ISPE Rocky Mountain Chapter serves one of the fastest growing pharmaceutical and biotechnology communities in the nation. The Rocky Mountain Chapter is composed of nearly 300 diverse members and promotes awareness and visibility of the pharmaceutical and biopharmaceutical industries via education and networking by way of national speakers, technical programs and other material. For more information about the ISPE Rocky Mountain Chapter 2016 Vendor Show, contact Chapter Manager Krisa Thomas at rm-ispe(at)comcast(dot)net. For more information about ISPE, visit ispe.org.